ABC News reports that Alan Thicke has died. The songwriter, talk show host, and TV star—best known for his role as kind-hearted, sarcastic father Jason Seaver on ABC’s long-running Growing Pains—apparently had a heart attack while playing hockey with his son, Carter. 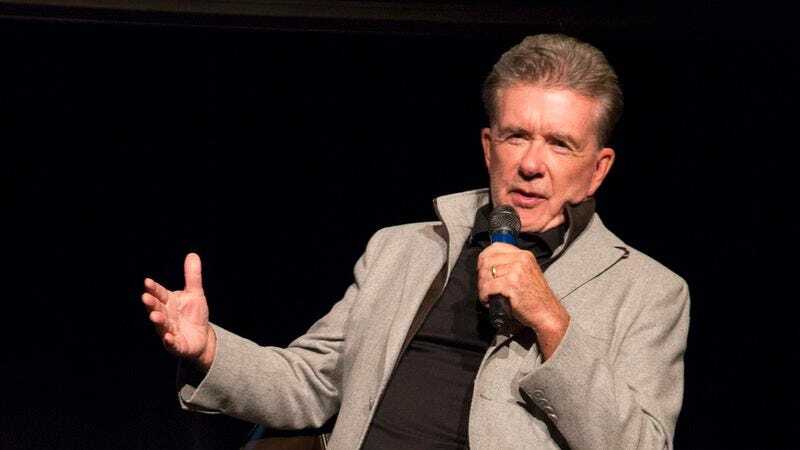 A TV polymath, Thicke got his start in the business as a writer, penning scripts for Paul Lynde, Richard Pryor, and Norman Lear, who tapped him as the head writer for his talk-show send-up Fernwood 2 Night. The series—which starred Martin Mull and Fred Willard as parodies of talk show host and sidekick, respectively—turned out to be prophetic; Thicke would later get his first taste of on-camera fame when he returned to his native Canada, hosting the daytime talk series The Alan Thicke Show. Introducing audiences to his dry wit and low, rolling voice, the series was a hit, paving the way for a similar (if more ill-fated) venture into American late night. Still, Night’s failure opened the door to Thicke’s most remembered role as an actor, stepping into the suit jackets and comfortable TV dad sweaters of psychiatrist Jason Seaver on Growing Pains. The show’s focus was often dominated by its young stars—including Kirk Cameron, Tracey Gold, and, later, Leonardo DiCaprio—but Thicke took frequent opportunities to break out of rote lesson-teaching and moralizing in order to unleash his slapstick, comic side. (He’d walk a similar balance as the inventor/father in Disney’s Not Quite Human series of TV films, from the same era.) Growing Pains would end up running for seven years—tying its frequently cited rival, NBC’s Family Ties—and enshrine Thicke in the hall of great ’80s TV dads. But acting was only one of Thicke’s passions: he also worked frequently as a successful songwriter, often within the medium of TV. His theme songs for Diff’rent Strokes, The Facts Of Life, and game show The Joker’s Wild aren’t just interesting pieces of “Did you know who wrote that?” trivia: they’re iconic, infectious pieces in their own right. After Pains ended in 1992, Thicke continued to work steadily, serving as a fixture of the American talk show circuit, and gamely poking fun at his own smooth-voiced, patrician demeanor. (See his appearance on the first season of Scream Queens, for instance, or a turn on Tim And Eric Awesome Show, Great Job!, in which he perfectly captures that series’ standard turn from calm, straight-faced authority into scatological madness.) The success of his son, “Blurred Lines” star Robin Thicke, continued to keep the family name in headlines, and Thicke and his family starred in a short-lived reality series, Unusually Thicke, for the TV Guide Network in 2014. In many ways, Thicke was the consummate 1980s sitcom performer. He carried within him the ability to deploy end-of-episode lessons and punchlines with equal skill, delivering with a semi-soporific dependability that reassured viewers that everything would be back to normal by the time the next episode came along. But focusing solely on that aspect of his career—to breeze past his contributions as a writer, composer, and that strange hybrid of vulnerability and showmanship that is the talk show host/guest—is to ignore the width of his talents, and a life that was spent digging into every creative aspect of what television had to offer.